Holy cow, did I just say that?!! Yep! With iphones and digital cameras we are so accustomed to having photos available to us in pixels we forget to print those photos and display them in our homes, either as prints or in albums. Digital files are great but what good are they when they’re sitting on your desktop or on a disk in your drawer? I do love that I offer digital files to my clients because I hate for anyone to have to “choose” between images. BUT your portraits are practically worthless (ack! Just said it again!!) if they aren’t printed and hanging on your walls. This is part of the reason that my digital images are sold with a print to match. You walk away from my sessions with something tangible. Let’s be real, computers crash, dvd’s and flash drives will become obsolete. Yep, your kids won’t even know what a flash drive IS let alone be able to access it. What good are these digital negatives if you don’t have them in print!? How many times do you actually show someone your digital images on your computer? How often will your kids look at their portraits that are sitting on your hard drive? Once? Never? What was the point of having those professional portraits captured if they are rarely or NEVER seen? To get the FULL benefit of custom portraiture you need to have your images printed and ON. THE. WALL. Those are the images that will be looked at the most, remembered the most and treasured the most. You are wasting your money if you aren’t printing your images for your walls. Now let’s talk about size. 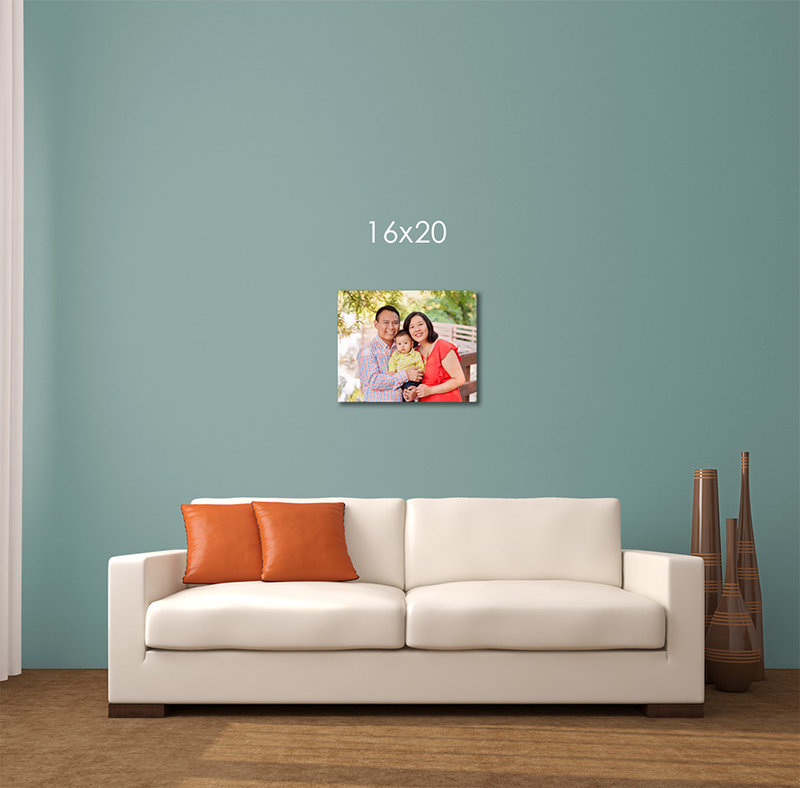 Size DOES matter;) Some of my new clients have never ordered anything larger than an 8×10 and they think that that is a “large” size when in reality an 8×10 is a desk size print or is meant to be clustered in a grouping of other larger pieces. 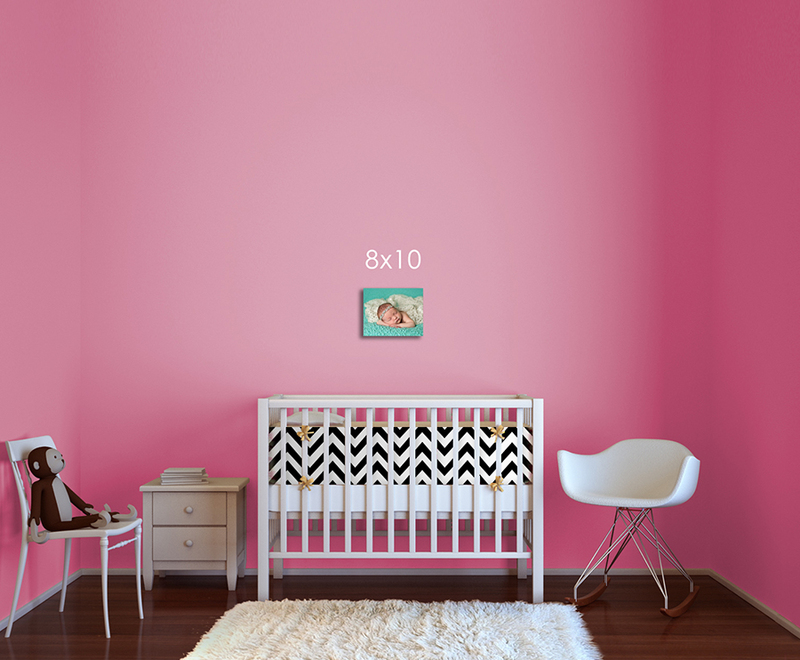 An 8×10 will get lost on a wall all by it’s little lonesome. If you’re not sure what size to print, use a piece of newspaper or cardboard cut to a larger print size and tape it to the wall where you’d like to hang your photograph and see which size works best for your space. You will usually find that you need to go up a size (or two!!) to fill the space and showcase those beautiful faces. 16×20 is a great size to start with and then you may want to go up a size. Prints seen from a distance, like the ones on a wall, should be large enough to see the faces clearly without walking up to the print to see the details. The reason I print my clients’ wall prints is that I know how to prepare my digital negatives for the print process. Colors will be vibrant, skin tones will be natural and there will not be distracting areas that are too bright or too dark. I do prepare files differently when they are going to be printed larger for a wall and I can assure you that those wall prints will look stunning. If you’re still skeptical I thought I’d show you a comparison of a 8×10, 16×20 and 20×24 prints on the wall.